Start by chilling your martini glass. If you don’t have the luxury of lots of freezer room, you can easily chill your glasses by filling them with ice water while you prepare your cocktail. Just be sure to dump the ice water out before you pour your cocktail in! Now, I’m a caramel fanatic, so one thing I like to do with this drink is rim the glass with more caramel! I’m making a quick Macadamia Nut Sugar to use on the rim as well! You can also rim it with brown sugar, cinnamon & sugar, or turbinado sugar. To make the Macadamia Nut Sugar take a 1/2 a cup of Macadamia Nuts and blend them in the food processor with 3 Tbsp brown sugar. This will keep for a few weeks if stored properly. After your glass is sufficiently chilled, you can rim your glass. On one plate put a few tablespoons of your caramel sauce. On a separate plate place some of your Macadamia Nut Sugar. Twirling your glass evenly, dip just the rim of it in to the caramel. Then, immediately in to the Macadamia Nut Sugar. Set it to the side. Okay, This next part is easy! 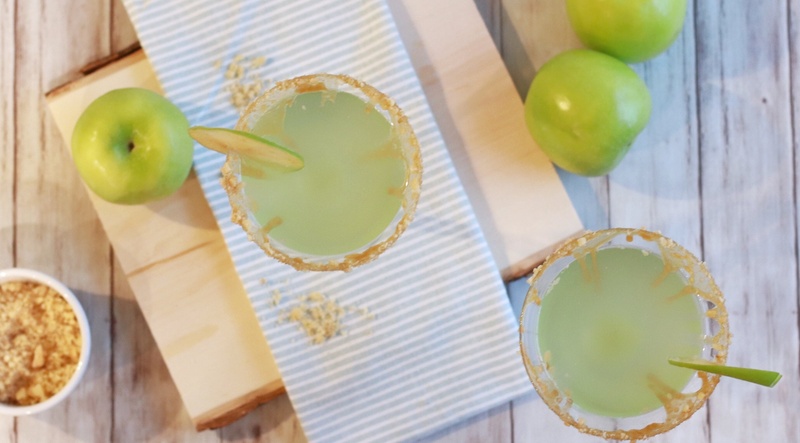 In a tall glass or cocktail shaker filled with ice, add the Salted Caramel Vodka, Apple Vodka, Lemon Juice, Simple Syrup, and Apple Liqueur. Shake or stir well. Strain into your chilled martini glass. Typically if you order an Appletini out, it is garnished with a maraschino cherry. 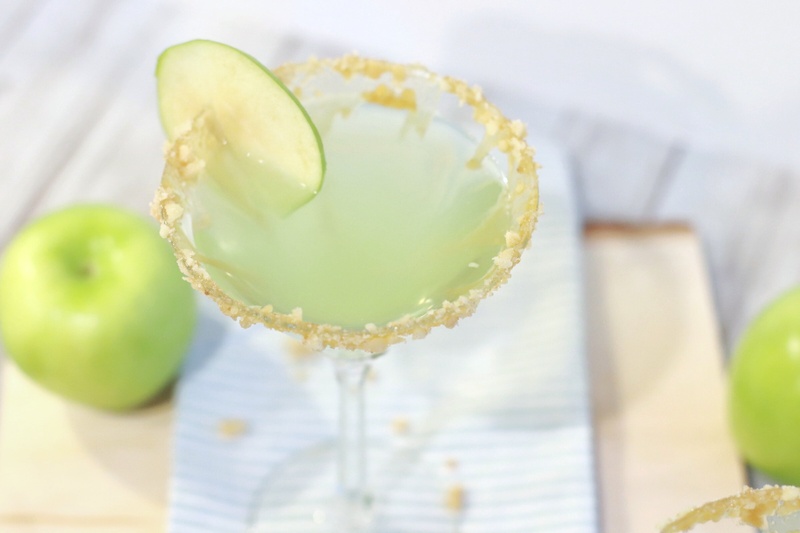 With this cocktail though I’m going with a simple thin apple slice for garnish. The Macadamias, Salted Caramel, and Apple-y goodness will happily fill any fall cravings you might be having! 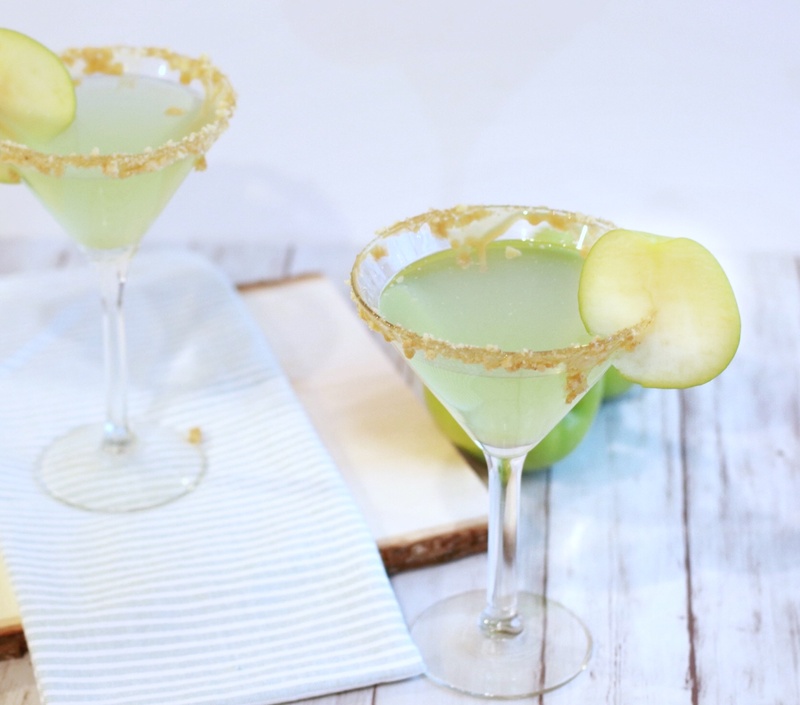 Rim glass with Macadamia Nut Sugar (Recipe above). 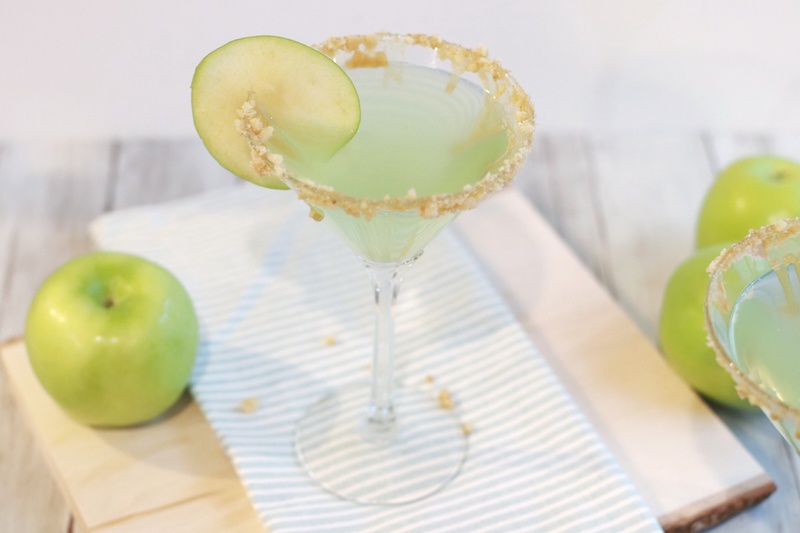 In a cocktail shaker filled with ice, add the Salted Caramel Vodka, Apple Vodka, Lemon Juice, Simple Syrup, and Apple Liqueur. Strain into chilled, rimmed martini glass. I am definitely going to make this – maybe even for this weekend! 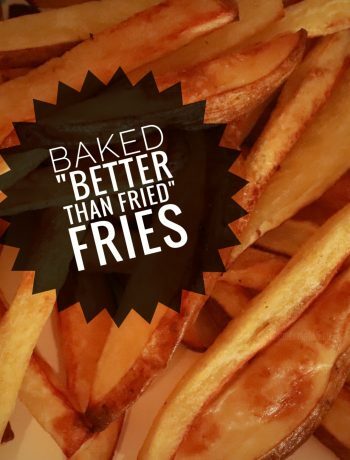 I love everything about the recipe! This looks so refreshing and I bet it taste very good. 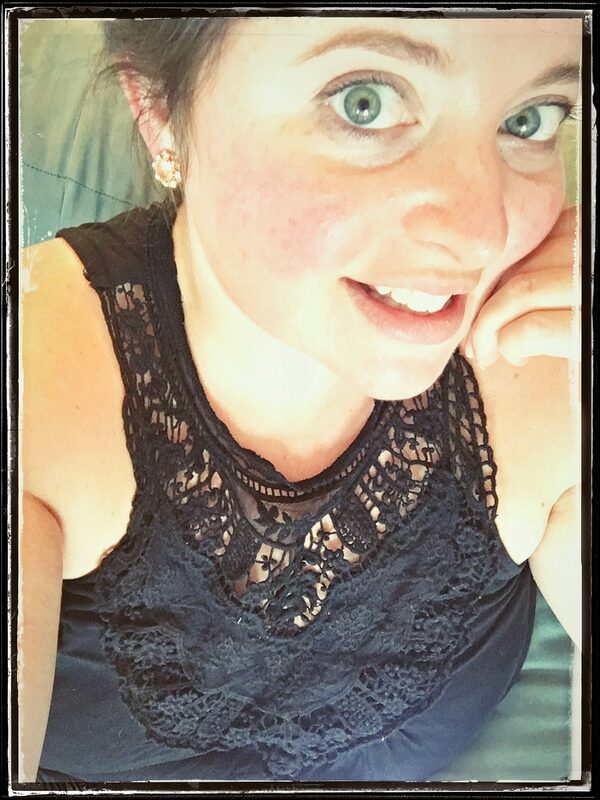 I don’t drink alcohol but I know a friend who loves making her cocktail drinks. I’m going to share this to her. This drinks look so tasty as I like how there are salted caremel added. I have never tried out the salted caramel. If I still drank vodka, this would be perfect. I will have to put this on my next family gathering list. I am a whiskey drinker now. 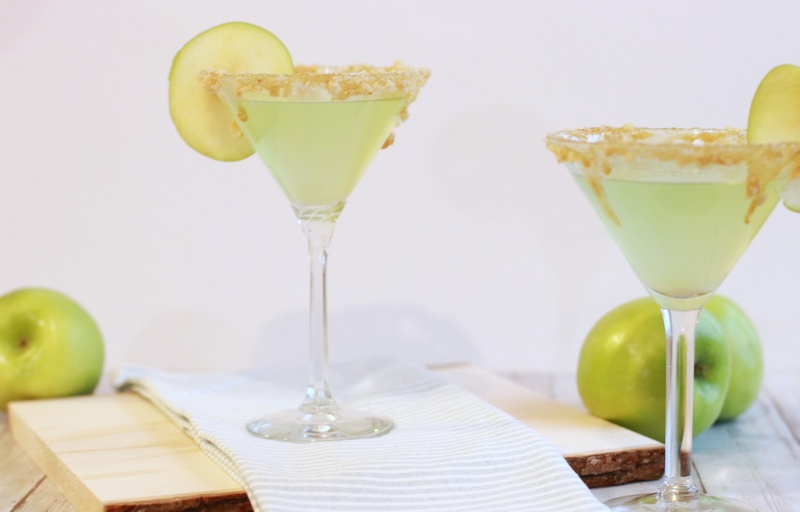 Oh wow this sounds like a cocktail I could get on board with – I like appletini’s and I love the twist on it with the salted caramel flavour. Certainly going to be giving this a try. omh this looks delish! Gonna try my hand at making some this week! You’re making me very thirsty. I’m a bar-tender and mixing drinks is my forte. This is a great recipe. Simple and no hassle. Definitely worth a try. My husband and my friends would absolutely love these. This would disappear in no time at our house! This is my kind of weekend treat. This cocktail sounds delicious! I have to try it at home I’m sure my hubby will like it, he’s a sweet tooth. This cocktail looks yummy! Super great drink for a girls night in.